The Bloor St. Culture Corridor, Toronto’s most diverse arts and culture district, celebrates spring with its first Jane’s Walk along the Bloor St. Culture Corridor exploring institutions, architecture, and stories of the Bloor St. Culture Corridor, led by Eric Sehr on Friday, May 6 at 5pm, starting at the Gardiner Museum. May also marks a month of photography in Toronto, and there are Scotiabank CONTACT Photography Festival exhibitions taking place at museums and galleries along the Bloor St Culture Corridor. Many more film screenings, festivals, concerts, museum exhibitions, visual art, and special events, take place on the Bloor St. Culture Corridor throughout the month. New on the Bloor St. Culture Corridor website is Bloor St. Culture Stories, #BCCStories, showcasing some of the unique voices and Bloor St Culture Corridor organizations online at www.bloorstculturecorridor.com/stories. Every Thursday evening, the Native Canadian Centre of Toronto presents the Big Drum Social, 6:30pm-8:45pm. Everyone is welcome. For more information, visit www.ncct.on.ca. The Bloor Hot Docs Cinema features the annual Hot Docs Canadian International Documentary Festival’s screenings until May 8. A trio of modern day sleuths seek out the painting locations of the Group of Seven in PAINTED LAND: IN SEARCH OF THE GROUP OF SEVEN, May 9 -12. Julie Taymor’s phantasmagorical and widely celebrated stage production of A MIDSUMMER NIGHT’S DREAM is on screen May 13-19. Gain unprecedented access to a cult and its followers in the penetrating exposé HOLY HELL, May 20-25. Celebrate the legends and pioneers of burlesque with the LEAGUE OF EXOTIQUE DANCERS, May 20-26. Uncover the world’s greatest wine fraud in the nail-biting documentary: SOUR GRAPES, May 27-June 1. ROYAL OPERA HOUSE: LUCIA DI LAMMERMOOR chronicles an ongoing feud between two families in 17th century Scotland on May 28. Doc Soup Sundays shares the story of an American icon and poet with MAYA ANGELOU: STILL I RISE on May 29. THE ROYAL BALLET: GISELLE dazzles audiences with the classic tale of betrayal, the supernatural and love on May 29. Curious Minds returns with ITALY: FROM TOP TO BOTTOM, May 31-July 5, and REBEL CINEMA: THE WORLD-CHANGING MOVIES OF THE 50s, 60S AND 70s, June 2-July 14. Visit www.bloorcinema.com for more information. The Talisker Players present Cross’d by the Stars, May 3 & 4 at 8pm. Guest artists Krisztina Szabó, mezzo soprano, and Aaron Durand, baritone, join the Players in musical tales of star-crossed lovers. They feature Mahler’s Songs of a Wayfarer (in Schönberg’s gorgeous chamber version) plus the premiere of Dean Burry’s thrilling new adaptation of The Highwayman, along with music by Purcell, Gluck and Leonard Bernstein. For more information, visit www.taliskerplayers.ca. The Toronto Consort presents the Monteverdi Vespers on May 6, 7 & 8, at Trinity St. Paul’s Centre. As a finale to their stellar concert season, The Toronto Consort presents one of the greatest musical masterpieces of all time, the Monteverdi Vespers of 1610! For this special performance they have brought together an international group of singers and players, led by British tenor Charles Daniels, joined by tenor Kevin Skelton and Montreal’s premier cornetto and sackbut ensemble La Rose des Vents. 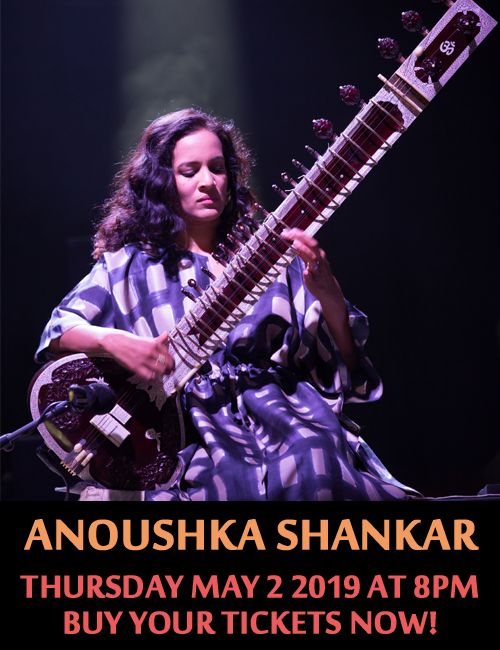 Visit www.TorontoConsort.org for more details. The Miles Nadal Jewish Community Centre, “the J,” presents the ReelAbilities Toronto Film Festival May 12 -19, marking the first time RAFF, the largest North American film festival, will be hosted in Canada. Celebrate Israel’s 68th birthday and enjoy a concert with popular entertainer Yitzhak Argaman at Eretz Zavat Chalav – A Yom Ha’atzmaut Concert on Thursday May 12, and attend the Yom Ha’atzmaut Celebration, featuring Israeli Folk Dancing, arts & crafts, music, snacks and more on Sunday May 15.The J is hosting a free panel discussion on Comic Adaptations of Jewish Stories, in partnership with TCAF on Sunday May 15.Join guest lecturer David Levine for his drop-in series Literature on Film: The Adventures of Sherlock Holmes on Thursdays, May 19 & 26. The InterLove Project, an art exhibition showcasing portraits of twenty diverse couples, will be on display in the gallery until May 22. The Gardiner Museum celebrates the 20th anniversary of the Scotiabank CONTACT Photography Festival with a unique Featured Exhibition by Toronto-based new media artist Clive Holden, on display in the lobby from May 1 to 31. Internet Mountains pairs Holden’s videos and digital paintings with historical objects from the Gardiner Collection, exploring the battle between digital and traditional art forms. May is also the last chance to see the special exhibition Beneath the Surface: Life, Death, Gold and Ceramics in Ancient Panama, which features incredible hidden treasures buried over 1,000 year ago by a mysterious civilization that left behind no written language. On May 18 at 6:30pm, archaeologist David Pendergast will give a presentation on another ancient society, the Maya, and how they used colour symbolism as a means of communication. And join the Gardiner Museum weekly for Family Sundays, included with admission, when parents and children are invited to take part in hands-on clay and tile-painting activities. Visit www.gardinermuseum.com for more information. Soundstreams presents Salon 21: The Regent Park Songbook on May 13 at the Gardiner Museum. Professional Canadian composers bring student-created lyrics to life in a series of pieces performed by student singers and pianists from the Regent Park School of Music. Composers and performers share their creative process in this exciting convergence of young and established talent. In partnership with the Regent Park School of Music. Free, with PWYC reserved seating available. Register online at www.soundstreams.ca. This month at the ROM enjoy A Third Gender: Beautiful Youths in Japanese Prints, opening on May 7. This ground-breaking exhibition examines unique gender structure in Edo Japan (1603-1868). The exhibition is complemented by Elements of Sake on Tuesday, May 3, at 7pm, featuring an introduction to sake with Certified Advanced Sake Professional Michael Tremblay. Tickets are available for purchase online. Further related to A Third Gender is the ROM Daytime lecture, Japanese Visual Culture: Gender & Sexual Diversity, on May 12 (free with RSVP). On Sunday, May 15, the ROM presents a workshop, Judaism: From Ancient Mystery to Modern Monotheism, which includes a ROM tour and lunch (mature content recommended for guests aged 18 and older). Also on display is Tattoos: Ritual. Identity. Obsession. Art. This stunning exhibition examines ancient practices, histories, meanings and the revival of the global phenomenon of body art (specially priced exhibition). Enjoy Tattoo themed lectures on May 10 at 7pm (Tunniit: Retracing the Lines of Inuit Tattoos), and on May 26 at 11am (Borneo: Explorations of Nature and Culture). Returning in May is Friday Night Live (FNL), presented by Ford of Canada, with a fresh line up including Punchline (May 6) and DinoNite (May 13). Visit rom.on.ca for details and tickets. New beginnings flourish this spring, as Tafelmusik Baroque Orchestra premieres Tales of Two Cities: The Leipzig-Damascus Coffee House, a new Alison MacKay production at Koerner Hall, May 19-22. It’s 1740, and coffee houses are the places to listen to music and share stories in both Leipzig and Damascus. Experience the visual splendour, music and contemporary tales of these historic locations. This multimedia event is presented in an entirely memorized programme by Tafelmusik Baroque Orchestra, along with Trio Arabica: Maryem Tollar (voice, qanun), Demetri Petsalakis (oud), Naghmeh Farahmand (percussion), and one of Toronto’s most engaging stage personalities, Alon Nashman. Join us for Tafelmusik’s season finale! Visit www.tafelmusik.org or call 416.408.0208 for tickets. At the Museum of Estonians Abroad/VEMU, the exhibition The Story of the Baltic University 1946-1949 is available to view only until May 15, 2016. On May 6 at 5pm join us for a Jane’s Walk led by Eric Sehr. We will be walking From ROM to VEMU: Exploring institutions, architecture, and stories of Toronto’s Bloor St. Culture Corridor. Join us in exploring one of the most culturally diverse districts in Toronto! In English. On May 19 at 7pm a new photo exhibition The Battle for Donetsk Airport by Sergei Loiko (Los Angeles Times) will open. Guest lecturers to be announced. All events are free of charge, however, a small donation is appreciated. The events take place at Tartu College (310 Bloor St. West). Visit www.vemu.ca for further details. The 21C Music Festival, May 25 – 29 at The Royal Conservatory, brings fresh new sounds and ideas from some of the world’s greatest musicians and composers to Toronto. Over five days, seven concerts feature 21st century music and more than 21 premieres! The festival opens on May 25 with Kronos Quartet with special guest Tanya Tagaq. American jazz pianist Brad Mehldau performs his Three Pieces After Bach on May 26. Also on May 26, Continuum Contemporary Music presents Japan: NEXT, with extraordinary music by the next generation of internationally acclaimed Japanese composers. On May 27, two Blackout concerts will be performed in complete and absolute darkness at 8pm and 10:30pm! The afternoon Cinq à Sept concert on May 28 includes premieres by Anna Pidgorna and Rodney Sharman. Ambient orchestral music composer Jherek Bischoff makes his Toronto debut on May 28 as he shares the evening with Brooklyn-based trio Dawn of Midi and Toronto’s The Visit. Violinist James Ehnes and pianist Andrew Armstrong end the festival on May 29 with premieres by Aaron Jay Kernis, Carmen Braden, and Bramwell Tovey. Info is at www.performance.rcmusic.ca/21C and tickets are available online or by calling 416.408.0208. The Sounds of Science: Music, Technology and Medicine – a free event presented by the University of Toronto’s Faculty of Music – will feature an interactive music science fair, five TED-like presentations and a musical performance. The event will demonstrate new insight into neurologic and clinical music therapy, psychological perception, cognition processes, and the science of elite music performance. Torontonians will have the opportunity to discover the unexplored – from seeing how an opera singer’s larynx changes during performance to how music influences functional recovery in diseases of the brain. The music science fair starts at 4:30 pm and the main stage performances in MacMillan Theatre starts at 5:30 and ends at 7pm. RSVP here: http://alumni.utoronto.ca/SoundsofScience. This May the Japan Foundation, Toronto welcomes a very special exhibition: Yakishime-Earth Metamorphosis Ceramic Exhibition (May 24-August 10). The exhibition focuses on the yakishime (“tightly bound in fire”) technique, in which unglazed wares are fired at temperatures of 1,200-1,300 centigrade. The resulting chemical reaction produces vitrification, or glassiness, and a rough, earthy surface punctuated with patches of brilliant glaze and colour. The process, which dates back over 800 years, became a mainstay of the Japanese ceramic repertoire in the 17th century, and remains a substantial component of the output for major ceramic centres such as Bizen and Shigaraki. The high temperatures involved make the results unpredictable, and the ceramist’s challenge is to retain control over the delicate transformations. The exhibition introduces functional yakishime used in the traditional tea ceremony, as well as tableware essential to everyday life in Japan. It also presents a wide range of decorative yakishime created by contemporary ceramic artists. The works will be displayed in the Japan Foundation, Toronto Gallery (2 Bloor Street East, Suite 300). Admission is free. Visit www.jftor.org for more information. 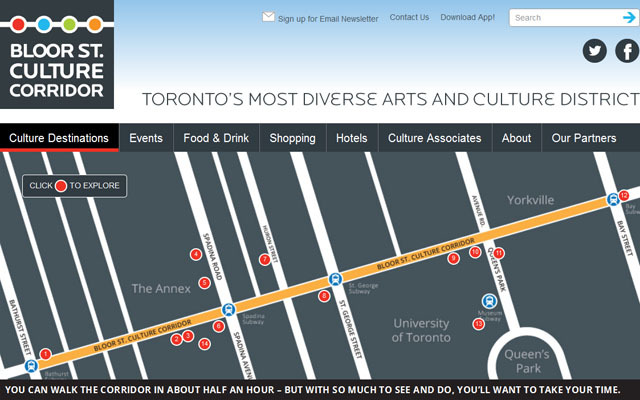 A complete calendar of events and programs, including links to each presenting organization and admission and ticket information, is at www.bloorstculturecorridor.com and on the Bloor St. Culture Corridor mobile app. The Bloor St. Culture Corridor, Toronto’s most diverse arts and culture district, is a true creative cluster; an arts and culture destination, and a sector-enhancing and community-building collaboration between some of Toronto’s most dynamic arts and culture organizations. All 19 of the Bloor St. Culture Corridor partner organizations present arts and cultural events for the public year-round in destination venues – all located in a cluster along a vibrant stretch of Bloor Street West. The Bloor St. Culture Corridor offers the public a wide variety of arts genres, from museum experiences to films, art exhibitions to music concerts, and opportunities to experience some of Toronto’s cultural diversity, including French, Jewish, Italian, Japanese, Estonian, and Aboriginal arts and culture. Each year more than three million members of the public go to Bloor St. Culture Corridor arts and culture destinations, and attend exhibitions, performances, and events. Together, the Bloor St. Culture Corridor organizations generate more than $629,500,000 in economic impact each year.